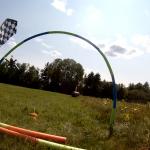 Drone racing events are popping up everywhere these days. Small Facebook clubs and big organizations alike are setting up races where pilots can show off their skills in front of friends and onlookers. 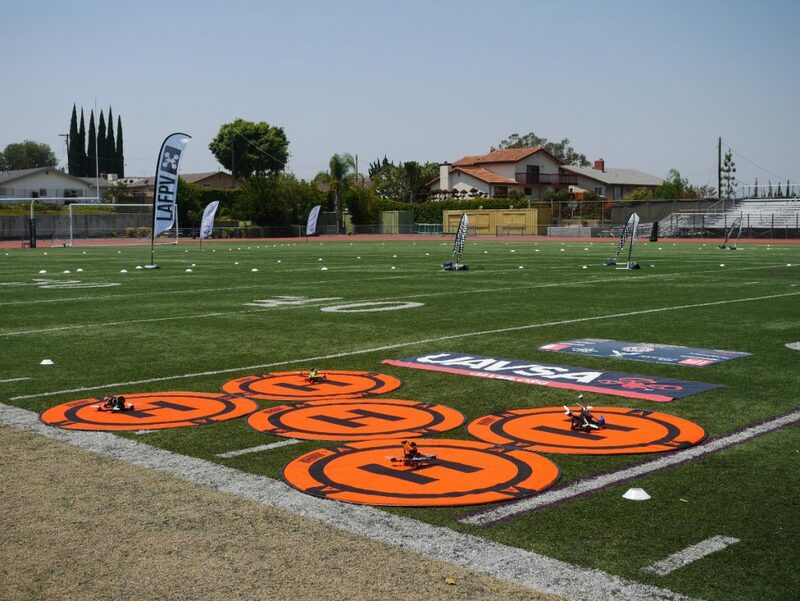 It can be daunting preparing for your first drone race – for both pilots and spectators. This article aims to give you some ideas on what to pack for your first race. We broke this list into two main sections: general items and race items. The general items are meant for both spectators and racers. The race items are targeted specifically for pilots flying at the event. Additionally, we also included some “nice to haves” and group ideas at the end of the article. Ready to prep for your first event? Read on! It’s the night before the race event, and you are frantically trying to pull items together for tomorrow. What do you bring? Worry not, as we have compiled a list of items that should make your event less stressful and allow you to focus on the most important thing: the racing! Most drone racing events occur outside during daytime hours. While there are a few indoor events starting to show up here and there, the vast majority of events occur at a field location. Do yourself a favor and protect yourself from the elements! If you live in a particularly sunny location like we do, bring sun protection. Sunblock at a minimum, but a good shaded hat can help keep the sun off your face and out of your eyes. Most events carry on for a number of hours, so be sure to reapply sunblock often. The AAD recommends reapplying sunblock every two hours. It can be hard to remember with all the activity and excitement going on, so set an alarm on your phone to help remind you. Sunny day at the starting line. Wide open space with no cover = sunburns if you aren’t careful! Layer on the sunblock. On the other hand, if you are in a wetter locale, bring a rain coat or umbrella. Most organizations will try and wait out a small bit of rain rather than cancelling the whole day. Similarly, bring something to cover your gear! While many people remember a rain coat, they may forget to bring something to cover all their electronics! Check to see if your gear bag has a built in cover, and use it if it does! If not, a heavy duty trash bag should work just as well, and stores easily in any bag. Finally, if the weather report calls for heavy rain or thunderstorms, expect a full cancellation. Sustenance: don’t forget water and food! Stay hydrated during the day by bringing plenty of water with you. 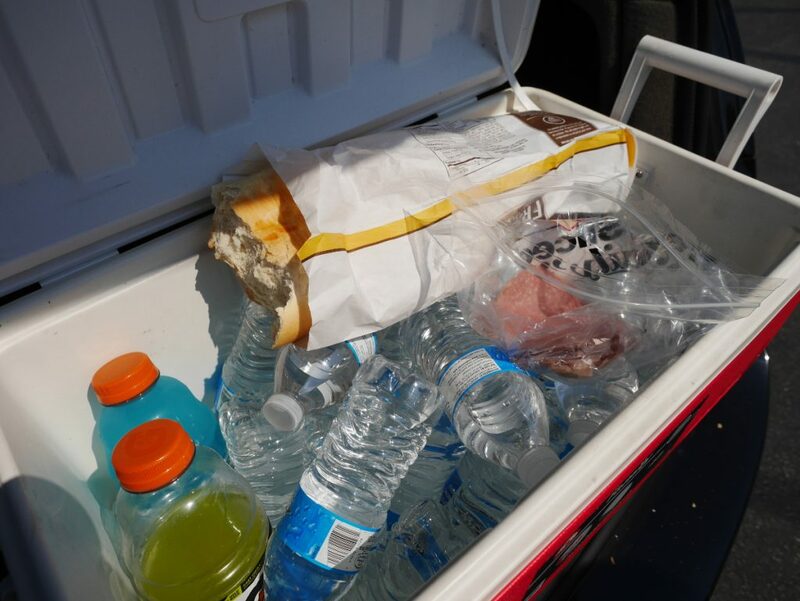 A cooler packed with ice and bottled water makes for an easy to access hydration stash! It also makes sharing with others who may have forgotten their water easier. If you are traveling light, you could fill a Nalgene bottle with ice and water to keep it cool throughout the day. Nuts / trail mix / jerky– high energy food that can quickly kill your hunger. Throwing a bag of almonds into your gear bag won’t take up much space. Energy / granola / protein bars – another compact snack that is easy to throw into your bag. Try and avoid melty bars (e.g. chocolate covered bars) that can make a mess. Deli meat and bread for sandwiches – At the LAFPV event, Chococopter showed up with a supermarket French bread loaf and a bag of salami. It was a cheap and easy way to put together lunch for multiple people! Our food and water supply for a day at the races! Props to Choco for the bread+salami! Equipment to watch the races: FPV goggles, monitor, etc. Want to watch the other pilots fly? Why not bring your FPV goggles and tune into their channel? You can learn a ton and watch some impressive flying from the perspective of the pilot. To get channel information, ask the race organizers the channels everyone is flying on, or ask around at the event. You will inevitably see a ton of people wearing headsets that can help you out – just don’t bug the people actively racing! Don’t want to lug around goggles if you aren’t racing? We recently reviewed an FPV watch monitor that is cheap and easy to bring to the field. Bring trash bags to pack out your garbage. Food wrappers, broken props, balls of electrical tape, whatever. This will preemptively help the race organizers before the end of the day when they are busy packing everything up. Similarly, offer to help out with any post-event cleanup, or bring extra trash bags for anyone that needs them. Race organizers work hard to find a flying location for everyone, and leaving it trashed could make it difficult to secure again. A long day at the field can leave you feeling pretty gross if the area doesn’t have any facilities to clean up at. Bringing some simple cleanup items such as hand sanitizer and baby wipes can help you feel fresh at the end of the day. These were invaluable when we went to a race in a dried out river bed on a windy day. Everyone was covered in a layer of dust, and were happy to cleanup before jumping in their cars to drive home. Similarly, bringing a towel to dust off dirty gear is a great idea. Be sure to bring some sort of seating with you to the field. 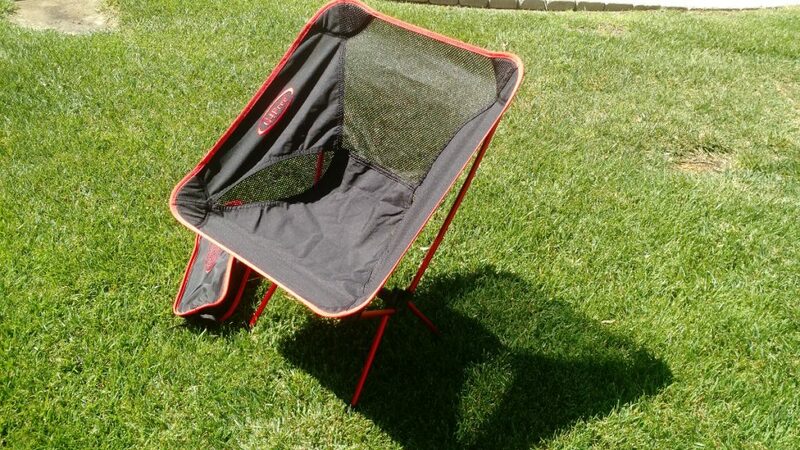 Most people opt for a foldable camping style chair for ease of transport. While many events have seating on the race line for pilots, seating may be limited for spectators or those waiting to fly on the sidelines. My portable chair setup! Fits easily in any field bag. We like using the chairs pictured above. These lightweight chairs break down into a bag about the size of a loaf of bread. They are part of our field bags already, so taking them to an event requires no additional work. Don’t forget the basics! Some races have entry and/or parking fees, so bringing a little cash is a good idea. Usually the event will be pretty clear about this beforehand, but being prepared never hurts. If the race is at an arena, fairgrounds, or other location where you would usually pay for parking, prepare to bring some cash. Many events also offer lunches or a snack table, but not for free in our experience. Finally, vendor tables at racing events sell parts or equipment you may be interested in. Due to many events occurring in remote locations, a credit card reader / app may not work perfectly and cash is the only option. 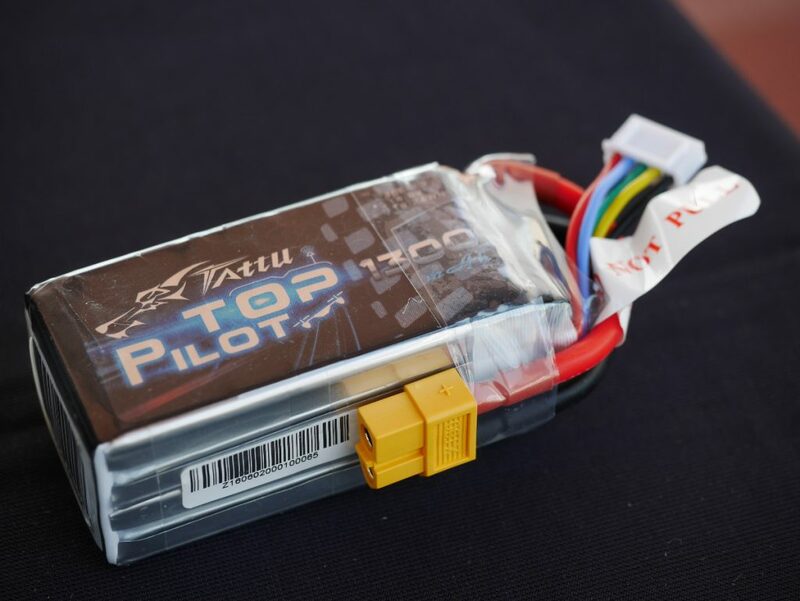 The sponsor list from LAFPV. Many of these fine folks had tables setup where you could purchase gear. Speaking of remote locations, you might run low on phone battery if you are taking pictures or posting to social media throughout the day without a power source. Having a portable battery pack on hand can be a life saver! These are also great for charging action cameras, portable speakers, and other gear. Finally, you need to find your way to the event, right? Now that Google Maps offers an offline mode, you can store the race location in your phone and not worry about lack of reception. However, what if you burn through your batteries and need to find your way home? Having a set of printed directions can help prevent end of day panic and get you back to civilization safely after a long event. Planning on participating in the race? Here we cover everything you need for a great first event. In general for this section, make sure each of these items is in working order before heading to the field. Take some time the night before to test your equipment so you aren’t stressing about it on race day! Don’t want to forget your racing gear if you are planning on stepping up to the starting line! At minimum, ensure you have your quadcopter, RC radio transmitter, and FPV goggles. Make sure you have a sturdy bag to carry everything in! Have plenty of batteries on hand to get you through the event. Each heat is going to require one battery. Coordinate with the race organizers to understand how many practice and race heats will occur per racer to gauge how many batteries you will need. Bringing extra batteries is much easier than bringing a charging station. Similarly, don’t forget to bring charged batteries for your FPV goggles! We recommend bringing extras if you want to watch other people race. Keep one battery specifically for flying so you don’t accidentally run out of juice during your heat! Don’t run out of power before the main event. Bring enough batteries to last you through practice heats and the main race heats! Can’t have enough of these! Always a good idea to have plenty of props on hand during race day. For safety, we would follow the battery rule: 1 full set per race heat. In terms of spare parts, use your best judgment. You probably won’t be doing any full rebuilds out at the field, but bringing some basic parts can get you out of a bind if something breaks. At minimum, make sure you have some extra prop nuts and frame bolts. 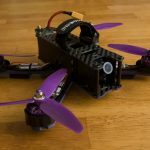 If you are comfortable making more advanced repairs at the field, having extra frame parts, an FPV camera, ESCs, or a motor or two isn’t a bad idea either. At minimum, you want a prop wrench, hex drivers, and possibly a portable soldering iron when going to the event. This should allow you to make basic repairs and quickly diagnose and fix problems. Generally, bring the tools you would normally bring to any other flying excursion. Additionally, having other quick fix toolbox accessories such as zip ties, electrical tape, and heat shrink can help in a pinch. Don’t forget the solder if you bring a soldering iron! Super, super important. Since you are racing with other people, everyone needs to make sure they are on their assigned channel. Having your channel guide handy, as well as any tools needed to adjust your VTX, will make this process much easier. It is not uncommon to call for changes on the race line, so having these resources handy will help reduce stress and make sure that you are setup correctly. Generally, when you are given a frequency, you are also given a polarization. This is mostly a suggestion, but following it can greatly improve your range and video quality. Figure out what kind of transponder the event or club is using, if any. The most popular one is the Trackmate system, generally used by MultiGP clubs. In many events, this device is not required to participate, but the rules may state that you are not allowed to ‘place’ without one. The IR LED on the transponder will need to be facing the correct direction, so be sure to figure that out beforehand. While most need to be pointed upward, some point to the side. Ask your group if you have any questions or issues with this. You will need to register your Trackmate with the race organizer when you get to the event. Similarly, many events are starting to use apps for race management and organization. 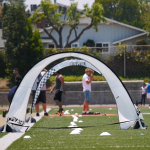 For example, LAFPV used Drone Squad for their summer events, which we looked into more detail about here. However, if an app is mandatory for racing, you don’t want to get bogged down setting up accounts at the field. Take the time to get these items setup correctly the night before. Traveling with a large group or have additional car space? The items below are quality of life items that can improve your race experience if you have the resources to bring them. None of the items below are required. You may need to fine tune or adjust PIDs or failsafe setup at the field. Having your charged laptop ready to go can allow for quick software adjustments at the event. Novuh’s laptop setup. Need initial PID tuning advice? Click this pic to go to his PID tuning guide! If you are attending an outdoor event, an E-Z UP or similar shelter can be a great way to get out of the sun and setup shop for making quick repairs. Coordinate with friends or other attendees to prevent bringing duplicate items. Be sure to bring stakes or some other method of securing down your shelter in case the wind picks up! Capture your race footage in stunning HD to share on YouTube later! Not only can you create a fun edit of your race day, you can also review the footage to find areas for improvement. Some might frown on the extra weight from an action cam system, but most pilots at an amateur level shouldn’t worry about it. We highly recommend labeling your camera with your name and contact information. Similarly, use a high quality mount that you have tested before race day. Action cameras have a wonderful tendency to bounce off after a crash, and nobody wants to postpone the next heat to search for a missing camera. Depending on the race location, you may not have access to any power source. If you or your group have a portable generator, it might be worth bringing along. While not necessary for most first timers or solo flyers, it can be a great investment for a group that flies frequently at remote fields together. 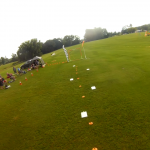 You may be tempted to bring a Tiny Whoop or RC plane to fly among like-minded hobbyists, however these can be a huge distraction for organizers trying to run a streamlined event. Furthermore, interference from powering up a VTX equipped micro quad could take an active racer out of the air. Before you start flying on the side lines, check with the race organizers if it is OK to do so. Even if it is approved, we recommend refraining from flying if people are actively racing. The race organizers likely spent a ton of time putting the event together, and want the day to go smoothly for everyone. Be sure to listen and follow any instructions that they give! Good to go. Get out there and enjoy your first drone race! Hopefully this article helps reduce the stress of going to your first event. If you do run into issues at an event and forgot something key, ask around! The hobby is full of helpful people that will likely be able to point you in the right direction. It is amazing how many people you can get introduced to just by talking to one person. If you have a problem or need something, speak up! As always, we want to keep this list up to date, so if you see anything missing, feel free to shoot us an email or comment below. How was your first race? Anything you forgot to bring?